In addition to having assisted with the comments submitted by the American Association of University Professors and the American Historical Association, today I submitted the following comments on the ANPRM. The PDF version may be easier to read. Thank you for the opportunity to comment on the advance notice of proposed rulemaking, “Human Subjects Research Protections: Enhancing Protections for Research Subjects and Reducing Burden, Delay, and Ambiguity for Investigators” (docket ID number HHS–OPHS–2011–0005). I am grateful to all of the ANPRM’s creators for taking this first step toward a much needed reform of the present system of research regulation. I write these comments as the author of “How Talking Became Human Subjects Research: The Federal Regulation of the Social Sciences, 1965-1991,” Journal of Policy History 21 (2009): 3-37, and Ethical Imperialism: Institutional Review Boards and the Social Sciences, 1965-2009 (Baltimore: Johns Hopkins University Press, 2010), both of which were graciously cited in the ANPRM. I also edited the 2011 special issue of the Journal of Policy History on human subjects research, which featured Susan Reverby’s influential article on the Public Health Service experiments in Guatemala. And since 2006, I have edited the Institutional Review Blog, http://www.institutionalreviewblog.com. I contributed to the response to the ANPRM submitted earlier by the American Association of University Professors, and I was consulted by the authors of the response submitted by the American Historical Association. I endorse those two responses wholeheartedly. In addition to the comments in those documents, I wish to offer the attached observations, which reflect only my views and may not represent those of the AAUP, AHA, George Mason University, or any other institution. Question 4: Should the regulations be changed to indicate that IRBs should only consider “reasonably foreseeable risks or discomforts”? A. I support this change and suggest adding the word “significant” to describe the risks that may be considered. The ANPRM acknowledges that “it is not clear that . . . [IRB] members have appropriate expertise regarding data protections.” That is true, but it is not clear that IRB members have appropriate expertise regarding physical risk, psychological risk, the benefits of particular restrictions, or any of the other factors that they would need to do their appointed tasks. The ANPRM notes that when identical proposals are submitted to multiple IRBs, researchers can expect “widely differing outcomes regarding the level of review required.” But that is just a small part of the problem. Given identical proposals, IRBs will disagree about a great many things. This is not just a problem for multi-site studies; it is also an indicator that IRBs are making many or most of their decisions based on guesswork. That is, if the same proposal given to three IRBs comes back with three wildly different demands for changes, at some level it means that two of the three have offered bad advice. In extreme cases, a committee may applaud part of an application as “eloquent and well-grounded in the literature,” only to fault the same section when the same application is reviewed after revisions. This statement is as true today as it was then. Regardless of the specific adjectives and adverbs used, any regulation should be accompanied by guidance recommending that IRBs base their decisions on empirical evidence. If a researcher can show that a given method is in regular use, and an IRB cannot show that the method regularly abuses research participants, the research should proceed. IRBs should also document the reasons for their decisions, something they seem to be doing now at a low rate. The University of Texas’s 2009 report, “Trust, Integrity, and Responsibility in the Conduct of Human Subjects Research,” encourages IRBs to act based on “evidence‐based research” and “empirical studies.” The federal government should do the same. Finally, I recommend the establishment of a national clearinghouse to disseminate the empirical findings of researchers and IRBs. Answer: The Common Rule currently claims to regulate all “research” even though it has no statutory authority to do so. It is this over-reaching that diminishes protections for research subjects while imposing burden, delay, and ambiguity on investigators. The Common Rule should be rewritten to emphasize its applicability only to biomedical and behavioral research. 2. Human experimentation and other methodologies whose results depend for their validity on limiting or controlling the information available to research subjects: that is, study designs reliant either on the passive withholding of information concerning what the study is about or on the active provision of misinformation: e.g., the use of placebos in biomedical clinical trials; the use of confederates in behavioral research concerning competition, conformity and the like; and the deceptive presentation of fictional narratives as actual news reports in social research concerning public opinion. This definition would achieve many of the objectives of the ANPRM and bring the regulations into compliance with the underlying statute and the intent of Congress. ANPRM’s Question 25 hints that regulators are considering letting journalists, historians and other humanists off the hook by declaring their work to be non-generalizable, and therefore not subject to regulation under the Common Rule. This conflicts with OHRP’s earlier determination that “oral history interviews, in general, are not designed to contribute to generalizable knowledge.” If generalizable means that some future researcher might conceivably use the information, then nothing is non-generalizable. Do not daily newspapers; criminal, civil and congressional investigations; and disease monitoring all create an archive for future research? The term “research” designates an activity designed to test an hypothesis, permit conclusions to be drawn, and thereby to develop or contribute to generalizable knowledge (expressed, for example, in theories, principles, and statements of relationships). Research is usually described in a formal protocol that sets forth an objective and a set of procedures designed to reach that objective. This goes some way to distinguish research from diagnosis of an individual patient—the main goal of that section of the Belmont Report—but I am not even sure of that; I would hope that an MRI operator diagnosing a patient has an objective and a set of procedures designed to reach that objective. Conversely, qualitative social scientists debate whether their work is generalizable. So “generalizable” covers research that the National Commission did not want covered and leaves uncovered research that the Commission did seek to regulate. The American Anthropological Association’s proposal makes sense. a. Should the number of research participants in Federally funded human subjects research be reported (either to funding agencies or to a central authority)? If so, how? Answer. I agree with the ANPRM’s intent “not to expand the information that has to be reported.” Qualitative researchers should not be expected to produce quantitative data. That is, for a researcher whose results already depend on careful counts, it is relatively easy to report figures to federal regulators. But an ethnographer who attends mass events should not be expected to guess how many people he or she observed. Nor should an interviewer have to tabulate how many people he or she interviewed in a given year. b. What additional data, not currently being collected, about participants in human subjects research should be systematically collected in order to provide an empirically-based assessment of the risks of particular areas of research or of human subjects research more globally? Answer. These questions seem to envision collecting only data on adverse events and unanticipated problems that come about as a result of research. What about adverse events and unanticipated problems that result from IRB review? In order to know if the system is working well, we must measure its costs as well as its benefits. Thus, the government should establish a formal mechanism for registering researcher and participant complaints about inappropriate restrictions and requirements. Question 69: There are a variety of possible ways to support an empiric approach to optimizing human subjects protections. Toward that end, is it desirable to have all data on adverse events and unanticipated problems collected in a central database accessible by all pertinent Federal agencies? Answer. The most recent comprehensive data on the IRB system as a whole come from the mid-1970s survey conducted for the National Commission for the Protection of Human Subjects of Biomedical and Behavioral Research. If new data are collected, they should be analyzed and presented in a form accessible to the general public as well as federal agencies. Question 9: How frequently should a mandatory review and update of the list of research activities that can qualify for expedited review take place? Should the list be revised once a year, every two years, or less frequently? A. Not only the expedited-review list be reviewed at least every three or four years, but so should the entire regulation. And the regulation should be overhauled every twelve years in the light of experience. Question 73: To what extent do the existing differences in guidance on research protections from different agencies either facilitate or inhibit the conduct of research domestically and internationally? What are the most important such differences influencing the conduct of research? A. The National Science Foundation and the Agency for International Development have posted interpretations that discourage overregulation of classroom activities, oral history, journalism, and other endeavors. This shows the value of reducing OHRP’s role as the sole lead agency for the interpretation of the Common Rule. Instead, agencies that sponsor non-health research should have a greater voice. The ANPRM contemplates creating “a standing Federal panel” to review and update the list of research activities that can qualify for expedited review. This is far too modest a proposal. In fact, a standing federal panel should be empowered to offer guidance on all elements of the regulations and to revise the regulations themselves periodically. Moreover, the Belmont Report should be retired and replaced with a statement on research ethics that can be updated to reflect current thinking and experience. my colleagues and I fully anticipated that an Ethical Advisory Board (EAB) would he established as a standing agency within the Department of Health and Human Services. We had so recommended in almost all of our reports. We expected that such a Board could be the living oracle of Belmont’s principles. Just as our Constitution requires a Supreme Court to interpret its majestically open-ended phrases, and, if I may allude to my own Catholic tradition, as the Bible requires a living Magisterium to interpret its mystic and metaphoric message, so does Belmont, a much more modest document than Constitution or Bible, require a constantly moving and creative interpretation and application. Congress abolished the National Advisory Council in 1978. Since then, there have been various federal bodies charged with reviewing the protection of human subjects. But these have been largely ineffectual. For one thing, they have lacked the power to issue guidance. Under the current system, SACHRP can make recommendations to OHRP, but only OHRP can issue the guidance. This creates a bottleneck. In some cases, federal regulators have explicitly refused to offer clear decisions about murky regulatory language. In 2003, for example, Dr. Carome of OHRP issued guidance about the applicability of the Common Rule to oral history that left both historians and university administrators unsure how to proceed. Pressed to clarify his stance, he stated that OHRP was too busy to do so. What we need is a permanent federal body with the power to issue prompt, clear, official guidance. It must be more representative than the current bodies such as SACHRP or the Presidential Commission for the Study of Bioethical Issues. In 2003, the National Research Council’s Panel on Institutional Review Boards, Surveys, and Social Science Research concluded that “Any committee or commission established to provide advice to the federal government on human research participant protection policy should represent the full spectrum of disciplines that conduct research involving human participants.” Neither the presidential commission nor SACHRP approach this standard. the creation of a commission constituted specifically of social scientists (e.g., sociologists and the like), humanistic social researchers (e.g., cultural anthropologists and the like), and humanists (e.g., historians, legal scholars, and the like). Rather than adapting strategies developed to protect biomedical information—which are fundamentally incompatible with core intellectual and ethical commitments of humanistic social studies—this commission would be tasked with developing alternative guidance appropriate for their fields. The ANPRM notes that “although the regulations have been amended over the years, they have not kept pace with the evolving human research enterprise.” I expect the next decades to witness equally dramatic changes, so I suggest a mechanism for periodic revision of the regulations. While it is true that the ANPRM “offers a rare opportunity for needed modernization,” there is no reason for opportunities to remain rare. Linda C. Thornton, “The Role of IRBs in Music Education Research,” in Linda K. Thompson and Mark Robin Campbell, eds., Diverse Methodologies in the Study of Music Teaching and Learning (Charlotte, North Carolina: Information Age, 2008), 201-214; Jim Vander Putten, “Wanted: Consistency in Social and Behavioral Science Institutional Review Board Practices,” Teachers College Record, 14 September 2009; Alexander Halavais, “Rethinking the Human Subjects Process,” DMLcentral, June 14, 2010, http://dmlcentral.net/blog/alexander-halavais/rethinking-human-subjects-process. Brian Mustanski, “Ethical and Regulatory Issues with Conducting Sexuality Research with LGBT Adolescents: A Call to Action for a Scientifically Informed Approach,” Archives of Sexual Behavior 40 (April 29, 2011): 673-686. James D. Shelton, “How to Interpret the Federal Policy for the Protection of Human Subjects or “Common Rule” (Part A),” IRB: Ethics and Human Research 21 (November-December 1999), 7. Survey Research Center, Institute for Social Research, University of Michigan, “2009 Follow-Up Survey of Investigator Experiences in Human Research,” December 2010, table 15. 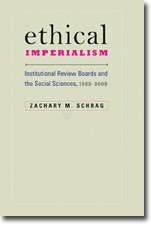 Zachary M. Schrag, Ethical Imperialism: Institutional Review Boards and the Social Sciences, 1965-2009 (Baltimore: Johns Hopkins University Press, 2010), 100. Department of Health, Education, and Welfare, “Secretary’s Interpretation of ‘Subject at Risk,’” Federal Register 41 (28 June 1976), 26572. Jonathan T. Church, Linda Shopes, and Margaret A. Blanchard, “Should All Disciplines Be Subject to the Common Rule?,” Academe, May-June 2002, 62-69; Malone, Ruth E., Valerie B. Yerger, Carol McGruder, and Erika Froelicher. “‘It’s Like Tuskegee in Reverse’: A Case Study of Ethical Tensions in Institutional Review Board Review of Community-Based Participatory Research,” American Journal of Public Health 96, no. 11 (November 2006): 1914-1919. Albert R. Jonsen, “On the Origins and Future of the Belmont Report,” in James F. Childress, Eric M. Meslin, and Harold T. Shapiro, eds., Belmont Revisited: Ethical Principles for Research with Human Subjects (Washington: Georgetown University Press, 2005), 10. Shelton, “How to Interpret the Federal Policy,” 6-9. Constance F. Citro, Daniel R. Ilgen, and Cora B. Marrett, eds., Protecting Participants and Facilitating Social and Behavioral Sciences Research (Washington: National Academies Press, 2003), 8. Australian National Health and Medical Research Council, Australian Research Council, and Australian Vice-Chancellors’ Committee, National Statement on Ethical Conduct in Human Research (Canberra: Australian Government, 2007), 97.